There are definitely days when I know I’ll be doing something mundane and know that I need a loud outfit to get me through the day. I know that sounds crazy but for me, its the little things that keep me going. In this case I wanted to mix stripes, camo and leopard print. I hear the more patterns you mix together the better they match. Sounds strange but piling on multiple patterns creates an effect where no single pattern stands out. How many patterns would you mix together? Do you have a limit? Loving your mix of patterns here, it all works so well together! that dress is awesome! love the stripes! love the mix of all the patterns here! I really love the pattern mixing here. I’ve never tried combining more than two patterns, but this all totally works. I have variations on all 3 and may have to steal some outfit inspiration here! Pattern mixing perfection here, girl! LOVE it! I’m finally getting used to the notion of mixing patterns. I love it on other people but I never feel like it “works” for me. No more! 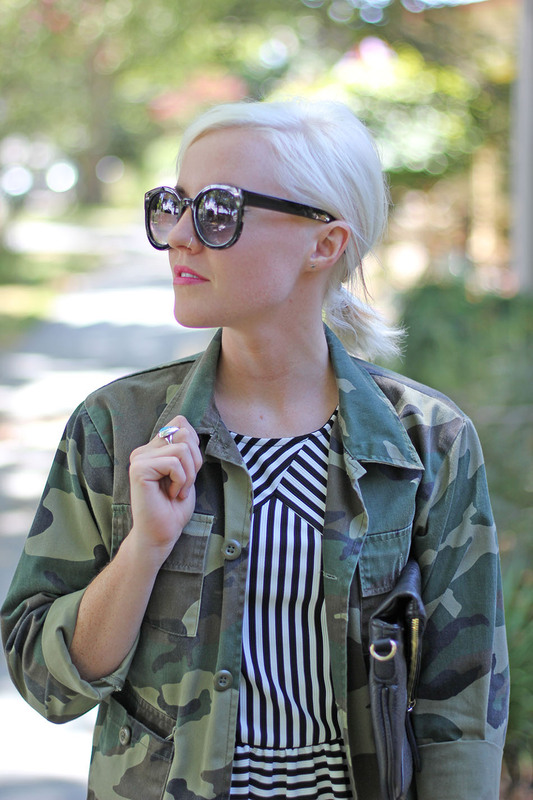 This outfit is a great reminder that pattern mixing is fun and chic! Love the prints all mixed together. What a rad look! Love love this look! Adore these patterns together. Cute mix. What about a belt? I love everything about this look. I’ve basically been imagining this combo in my head preparing for fall. You nailed it!